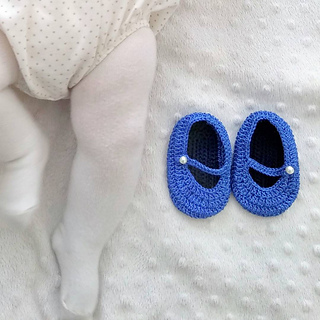 This pattern is written for 3-6 months baby size and includes 2 charts. 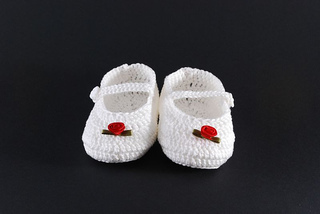 The 3 other sizes (0-3, 6-9 and 9-12 months) are explained in the instructions. 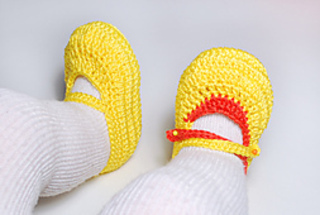 These sweet Baby Mary Jane style booties were one of my first crochet designs. 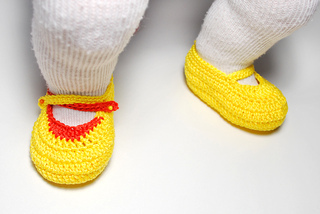 My niece Paula was just born and I wanted to crochet some beautiful shoes for her. 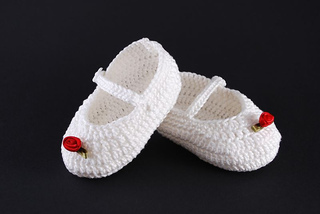 The first pair were the white ones with the Red Rose on them. I have crocheted them using Capri and Bolero yarn, both by Katia; any other Sport (fine 2) or DK (light 3) yarn could be used for this pattern. The shoes are worked in the round, starting the foundation from the toes up, that way the joints will be at the heel and back of them. UPDATE: Este patrón también está disponible en Español.